Elly Viner. She’s the Executive PR and Partnerships guru behind the powerhouse that is Street Feast, and we can also confirm that she’s incidentally a pretty cool girl. How do we know this? We know this because last week we had the exciting opportunity to spend the afternoon with Elly at Dinerama, the insanely popular Shoreditch branch of Street Feast, whilst getting the low-down on the Street Feast brand, what life is like when you get to spend every day hanging out at some of London’s best-known street food markets, and the upcoming National Burger Day in association with Mr. Hyde. We’re setting up for filming and it’s instantly obvious why Elly, quote herself, ‘feels like part of the furniture’ at Street Feast, despite having only just marked her first anniversary with the brand. She’s laid-back, fun, cool and positively personable; she epitomises the Street Feast ethos that she describes as ‘creating new, welcoming community spaces for everyone in the area’. These areas are the rebirth of disused spaces, such as the old truck depot better known nowadays as Dinerama, or the Lewisham location of Model Market which was previously a disused farmers’ market. Street Feast has taken these locations and worked their innovative magic to turn them into day and night street food markets, serving as a home for passionate traders who are given the opportunity to experiment on a constant buzz of hungry Londoners who are ready and waiting to ‘eat the world under one roof’ as Elly so accurately puts it. 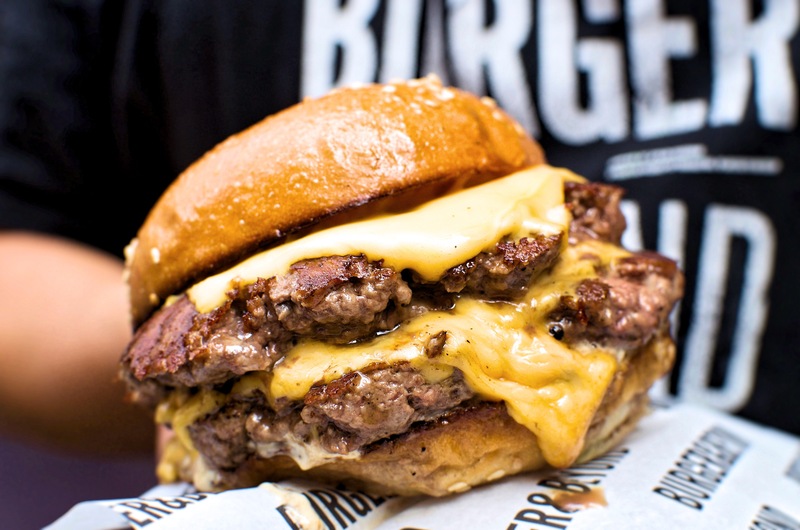 Such opportunities have served as a catalyst for certain traders who now have fully fledged, highly-rated restaurants, such as Smokestak who have opened their doors on Sclater Street and Breddos who are due to launch their second venture on Kingly Street in September. 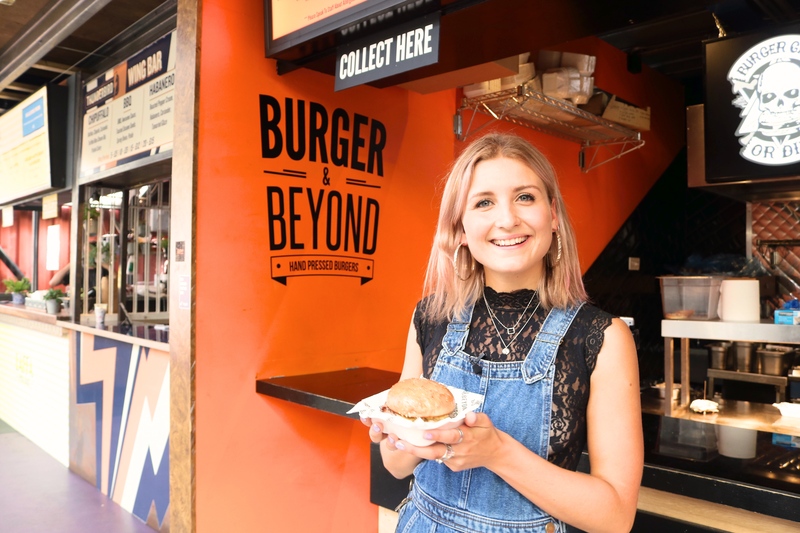 Before landing her dream job at Street Feast, Elly was a regular reveller at all four of their locations, never tiring of the endless variation on offer. Unsurprisingly, when we asked her what her favourite dish was at our filming location Dinerama, she struggled to give us an isolated answer, instead filling us in on the uniqueness of each trader. We heard about Lagom’s live-fire Swedish barbeque (her top tip is to go for the pork belly bun), the innovation of Club Mexicana’s vegan dishes and their stand against the stereotype of vegan food being uninteresting, the freshness of the seafood at Prawnography and the ever-growing popularity of those drool-worthy burgers at Burger and Beyond. For those of you who think Elly’s job as executive PR for the Street Feast brand sounds pretty cool (join the club), she advises that it takes a personable, confident person with good communication skills to think on their feet in an environment where decisions can be made at short notice. She suggests getting some experience at a PR agency to learn basic tasks such as writing up press releases and media lists in order to transfer these skills to a PR job in the industry that you are passionate about. Better get cracking then! Keep your eyes peeled on our Youtube channel over the next few days for our exclusive video interview with Elly! Check out Street Feast markets on our Streats app, available from the iOS App Store. Included are Dinerama, Hawker House and Model Market with the latest edition Giant Robot coming soon! 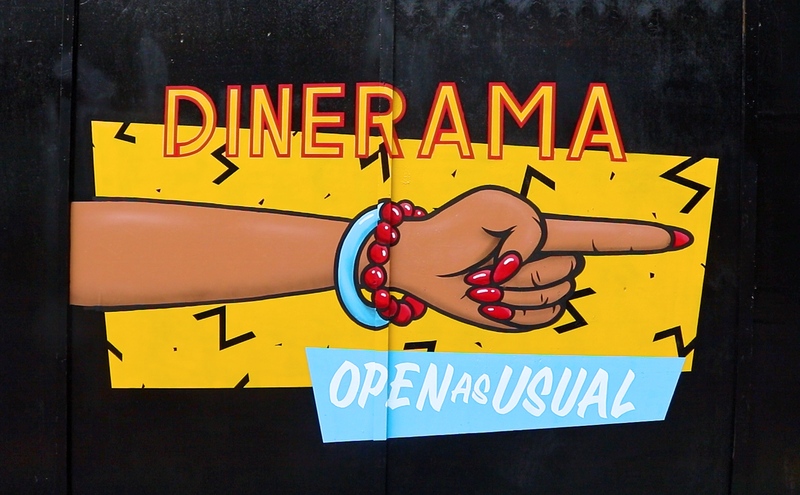 Dinerama is open every Thu-Sun from 12pm to Late. Giant Robot is open every day from 11am to Late. Hawker House is open every Fri from 5pm and Sat from 12pm to Late. Model Market is open every Fri/Sat from 5pm to Late. © 2019 Streats. All rights reserved.